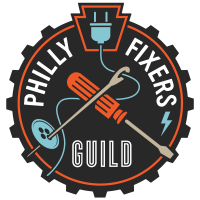 Join us at Circle of Hope in Fishtown for our long-awaited Spring Repair Fair. Our team of volunteer Fixers will help you learn to make repairs to any broken item you can bring in! This is a free event; we want our neighbors to repair, rather than replace their possessions when they stop working. Together we can decrease the amount of waste we create and reduce the amount of unnecessary purchases we have to make when things go wrong. Can I bring about six broken small appliances, let you fix them (at your leisure), them you donate/sell/give them away? Hi Ginny! While we like to have our guests leave with items repaired, fixing broken things is not really our main goal. Instead, we strive to instruct people in making their OWN repairs (initially under our support/guidance). We want folks to leave the event with new skills and the gumption to make future fixes on their own. The Guild wasn’t created to act as a repair shop, but rather an experience that our guests and supporters actively participate in. Thanks for thinking of us!